5-Axis Vertical Machining Center - Kuhn Tool & Die Co. Kuhn Tool & Die Co. 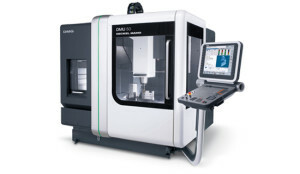 The DMU-50 is our new heavy duty production milling machine. It gives us the ability to do full simultaneous 5-axis milling capabilities in a 19″ cube work envelope. With the DMU-50 we can provide more intricately designed hard milling. We can give you faster turnaround and higher precision with less set-up.